The artist and filmmaker Derek Jarman died on 19 February 1994. To mark 20 years since his death from an AIDS-related illness, a series of events and screenings are happening throughout the year, including two recently opened exhibitions in London. We talk to the shows' curators and explore the riches on display. Mark Turner, Professor of English at King’s College London and curator of Derek Jarman: Pandemonium, is explaining the show’s title. The exhibition forms part of Jarman2014, a year-long cycle of events, exhibitions and film screenings commemorating the life and work of Derek Jarman, the pioneering artist, filmmaker, gardener, poet and queer activist who died 20 years ago on 19 February 1994 from AIDS-related causes. For Pandemonium, Turner takes Jarman’s brief spell in the 1960s as a Humanities undergraduate at King’s as a starting point to trace a history of the artist’s life in London. 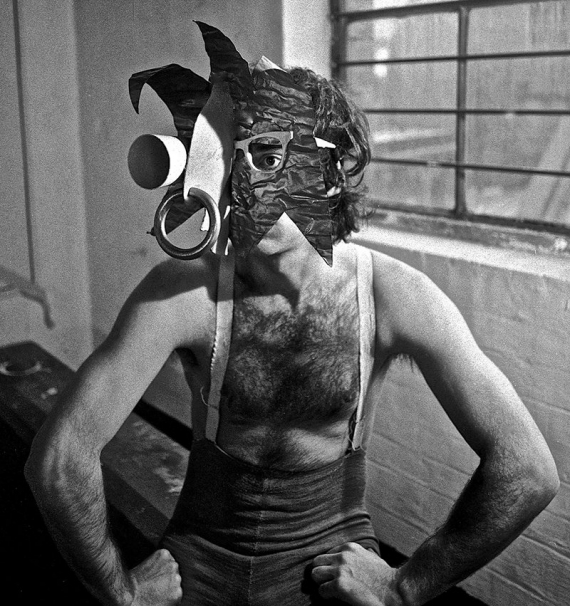 (Jarman had an agreement with his father that if he first completed an academic degree, he would be supported through painting studies at the Slade.) In a richly layered journey through the basement spaces of the college’s Inigo Rooms, we travel from his student days to warehouse living at Butler’s Wharf in the 1970s, to his use of Docklands’ derelict Millennium Mills in The Last of England (1987). As portable MP3 players play music that moves from haunting electronic compositions to sacred Medieval chants, Jarman’s Super 8 footage is edgy, intimate, playful. Quick cuts, double exposures and experiments with time-lapse and single frame shooting create a powerful, personal cinema that set a precedent for contemporary filmmakers such as Luke Fowler, winner of the inaugural Jarman award in 2008. Geometric vitrines and mirror-topped plinths contain Jarman’s intricately collaged notebooks, early set designs for the Royal Ballet embellished with sequins and pearlescent buttons, his correspondence on scraps of paper with Andrew ‘Alternative Miss World’ Logan, and more. The final room contains five simultaneous projections of The Last of England, expanding Jarman’s non-linear cine-poem into an immersive multi-screen installation. Detailed wall texts and an exhibition guide in the form of a compilation of Jarman’s writings – printed in antique gold and embellished with Elizabethan occultist John Dee’s monas hieroglyphica – underscore the show’s academic context and the love of knowledge, language and literature that pervades Jarman’s work. Turner’s own attention to detail honours Jarman’s erudition and rabid curiosity, and gives a fresh and intimate insight into the artist’s life and working process. 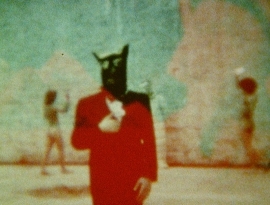 The bringing together of so many of Jarman’s belongings – homemade film props and paper masks, books and hand-written letters, even one of his Super 8 cameras still speckled with dust and inscribed in the artist’s calligraphic hand – helps to preserve and transmit a sense of Jarman’s creative energy. If Pandemonium succeeds in conjuring Jarman’s presence and vitality, it is by contrast his absence that is most keenly felt in Chelsea Space’s Almost Bliss: Notes on Derek Jarman’s Blue. 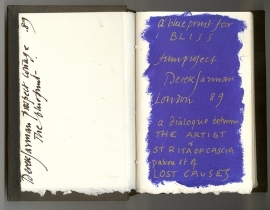 Centring on the artist’s A Blueprint for Bliss notebooks, made in 1989 as he developed what was initially conceived as a monochrome film dedicated to Yves Klein, curator Donald Smith has assembled a collection of objects, notes and artworks relating to Jarman’s final feature, creating an environment for reverie and reflection. With the gallery’s central ramp and floor-to-ceiling plate glass windows tinted IKB, the visitor is softly enveloped in the blue of Jarman’s thoughts – and, tragically, his fading vision. An alternating soundtrack of waves on the shingle beach at Dungeness – where Jarman would tend the garden of his timber cottage – and Klein’s single-note Monotone Symphony, is at once soothing and desperately poignant. Almost Bliss refers to two previous artists’ installations created in the wake of Jarman’s death: Peter Fillingham and Keith Collins’ contribution to the 1999 Witte de With show Stimuli, which also created an ambient environment around Jarman’s Blue notebooks; and Mark Wallinger’s 1994 installation for Every Now & Then, a group show in the former Edwardes Square artists studios in west London. For the latter, Wallinger placed a grand piano in a space used by Jarman shortly before he died, and still containing his unpainted canvases, brushes, paints and overalls. With the piano’s frame open but its keyboard closed, he played a recording of the instrument being tuned, evoking a tragic sense of imminence and potentiality. Here, 20 years on, a single empty sheet of manuscript paper recalls Wallinger’s artwork, and all those that Jarman never made. There is a deep sense of loss in the publication created by Smith to accompany Almost Bliss. A VOID is a series of black and white photographs of some of Jarman’s possessions, selected for their representations of holes and empty spaces: an inkwell with no ink, Jarman’s gardening gloves, hagstones from Dungeness beach, the inscribed Super 8 camera included in Pandemonium, here with its film compartment open and no cartridge inside. Reading the pages of the Blueprint notebooks encircling the gallery walls, to the swell of Klein’s D major chord, is to be taken deep into Jarman’s world. With frame on frame of gold words on blue, Jarman’s poetry spirals out much like the unravelling reel of test film in the central vitrine. When, in Blue, Jarman talks about the ‘pandemonium of image’ he counters it with: “I present you with the universal Blue / Blue an open door to soul / An infinite possibility / Becoming tangible.” And it is as though, in its solemn and heartfelt gesture of remembrance and friendship, Almost Bliss opens that door and invites you in.